String music from the 19th century closes this RSO season with the Brahms “Liebeslieder Waltzes”;Tchaikovsky’s beautiful “Andante Cantabile,” with RSO principal cellist Cole Tutino as soloist; and Dvorak’s brilliant “Serenade for Strings.” American Libby Larsen’s “Elegance” from her String Symphony will close our season-long tribute to women composers. 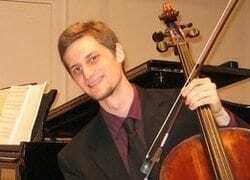 Praised by Fanfare magazine as a cellist of "striking ability," Cole Tutino has appeared as a soloist, chamber musician and orchestra member across the United States and Europe. He is principal cellist of the Richmond Symphony Orchestra (IN), and he has been a member of the New Hampshire Music Festival Orchestra, the Columbus Indiana Philharmonic, the Terre Haute Symphony Orchestra, and the Utah Festival Opera Orchestra. He has spent summers performing at the National Orchestral Institute, the Brevard Music Festival, the Mendocino Music Festival, and the Las Vegas Music Festival. An advocate of new music, Tutino gave the world premiere of David Canfield's Sonata for Cello and Piano, "Ordo Salutis," a unique work which depicts Christian tenets of salvation. He has also performed on Baroque cello with the Indiana University Baroque Orchestra, the Georgina Joshi Handel Project, and as part of the Bloomington Bach Cantata Project. Dr. Tutino is currently Visiting Assistant Professor of Cello at Miami University in Oxford, OH, where he teaches applied cello and aural skills, and performs with the Oxford String Quartet. He has also served as Visiting Instructor of Cello at Luther College in Decorah, IA, where he performed with the Luther College Piano Quartet. Born and raised in the San Francisco Bay Area, he earned his Bachelor's in Cello Performance at San Jose State University under the tutelage of Jennifer Kloetzel and the Cypress String Quartet. He studied with János Starker and Emilio Colón at the Indiana University Jacobs School of Music, where he earned his Master's and his Doctorate in Cello Performance. His research interests include lesser-known cello works of the Romantic era. He lives in Hamilton, OH with his wife, Selena, and his daughter, Evangeline.